Sparks, MD—Brimrose Technology Corporation’s BioTech Division has received an award to develop rapid tests for U.S. soldiers to protect them against the plague. The kits will provide a level of protection for U.S. soldiers as they increasingly are being stationed in Africa. 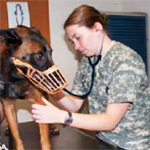 The award was approved by the U.S. Defense Threat Reduction Agency (DTRA) and is being contract managed by Advanced Technology International (ATI) representing the Medical CBRN Defense Consortium (MCDC). The goal of the program is to develop a field kit that can be used on soldiers by field medics without having to wait for laboratory analysis, which is currently required. A total of 500 kits will be produced for pre-clinical evaluation in the first phase. If successful, including approval from the U.S. Food and Drug Administration, the team will move to the second phase of the project which will entail human testing. The program could ultimately lead to thousands of such kits being manufactured on an annual basis for U.S. soldiers and other in-field personnel. 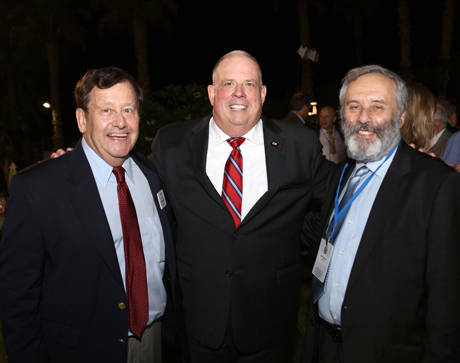 Sparks, MD—The U.S. Department of Energy has awarded Brimrose Technology a Phase 1 Small Business Innovation Research (SBIR) award to improve the manufacturing of small modular reactors by means of non-destructive testing. Penn State University is a subcontractor on the award. The focus of the Phase I portion of the award is to demonstrate the feasibility of an ultrasonic scattering technique (UST) used to characterize the microstructure and material properties for components made with various additive manufacturing characteristics. The testing will serve to determine whether heat treatment and/or additional processing is necessary. Gaining this understanding will lead to laying the groundwork for optimizing the process monitoring for large-scale inspections that will then lead to better component reliability, according to Brimrose Tech. By the end of Phase I, components made with various process parameters will be tested using the UST process, which will then be validated by using traditional destructive testing. For Phase II, BTC will focus on refining the electronics and data-processing algorithms in the prototype, optimizing the sensitivity, and testing components of different types and power sources. 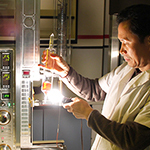 Brimrose has been making A-O Modulators and related components for more than 30 years. The modulators are used to control laser beam intensity, frequency modulation, frequency shifting, to control pulses and more. The AOMs are offered with conduction and water-cooled enclosures. Brimrose AOMs are offered from the ultraviolet to LWIR wavelength ranges for low and high optical power applications. They cover frequency ranges from just a few MHz up to 3.5 GHz. (For more information, call 410-472-2600). Sparks, MD—The Brimrose Technology Corporation (BTC) has received major additional Sequential Phase II program funding for three critical SBIR/STTR programs aimed at protecting military personnel and first responders going into potentially hazardous areas. 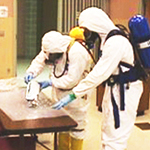 The U.S. Army base at the Edgewood Chemical and Biological Center (ECBC) at the Aberdeen Proving Ground has added significant funds to the programs for the purposes of developing better detectors to identify chemical and biological agents from a distance through Laser Induced Thermal Emissions (LITE), to do the same deploying Long Wavelength IR (LWIR) spectropolarimetry, and by using quantum dots to more fully develop low cost infrared cameras to help in this detection processes. The LITE program is an STTR, while the other two are SBIRs. Using Laser Induced Breakdown Spectroscopy (LIBS) processes, Brimrose scientists have developed a newer process known as Laser Induced Thermal Emissions, or LITE, to identify molecular signatures as well as the constituents commonly associated with LIBS. The plus-up focuses on the development of improved detectors to identify the molecules produced by laser pulses. The importance of this work cannot be overstated. For example, while LIBS might provide the operator in a potentially hazardous zone with the understanding that carbon, hydrogen, nitrogen and oxygen atoms are present, which may be seem harmless, LITE can provide the ingredients that would show that toxic compounds are in the area composed of these elements. The proposed LIBS/LITE program could also further improve the standoff distance at which instruments can identify such materials at up to 30m, which is important to the safety of those going into such hazardous areas, as well as improve the efficacy and ruggedness of the design. The goal of the AOTF-based spectro-polarimetric imaging system program is also to detect chemicals at a distance in a hazardous zone using a long-wavelength IR (LWIR) hyperspectral spectro-polarimetric imaging sensor. The goal here also is to improve the sensor to provide for standoff distances of up to five km. BTC also believes there are significant commercial applications for this product in atmospheric remote sensing and medical diagnostic applications. Regarding the use of quantum dots, BTC already has produced a SWIR FPA (short wavelength infrared focal plane array) camera, in collaboration with Research Triangle Institute, NC, with a resolution of 640 x 512 pixels and a sensitivity from 0.4 mm to 1.7 mm at room temperature. The goal is to continue to extend the operational wavelength range to 2.5 mm, and then 3.0 mm. BTC says the CQD-based SWIR FPA proposed would be on the order of 6-7 times less expensive, and would greatly enhance its utility. One application of the camera would be to aid the LIBS/LITE and spectro-polarimetric systems by developing cameras with extended ranges. Sparks, MD—Brimrose Technology Corp. (BTC) has been awarded nearly $150,000 to develop a new group of mercurous iodide materials for the purpose of helping the high-speed, high spatial resolution detection of X-Ray Imaging. The U.S. Defense Threat Reduction Agency (DTRA) made the award, which formally started earlier this week. BTC’s Dr. Sudhir Trivedi, the company’s Director of Research and Development, is the principal investigator on the award. The focus of the work will be on both the material engineering aspect of the material itself which includes crystal growth—BTC has its own crystal growth laboratory--along with fine-pitch pixel device fabrication development, x-ray response measurement, as well as theoretical modeling/calculation to demonstrate its feasibility of meeting or exceeding the desired specification. Both the government and commercial markets could greatly benefit from this semiconductor sensor, according to the proposal. When coupled with advanced CMOS-ASIC technology, the results can be applied to the identification and collection of data related to deeply buried targets in support of DTRA’s Counter-WMD/CBRNE missions. Such enhanced detection also has potential application to locate “dirty bombs” entering or inside the United States prior to detonation. NASA could also benefit from use of these new detectors in understanding the surface and sub-surface compositions of planetary bodies. The medical community may also benefit from the enhan.ced ability of large medical detection machines such as SPECT, PET and Spectral-CT to detect cancer at a very early stage, including breast cancer in women. BTC is the research laboratory of the Brimrose Corporation of America, a high-tech company involved in advanced materials development, AO components, near IR spectrometers, as well as high-tech solutions for the U.S. military and NASA. For more information, call 410-472-2600. Sparks, MD--Announced only a few short months ago, Brimrose Technology’s Biotech division already has begun offering multiple products as it rapidly grows into the accelerating biotech marketplace. Brimrose Technology now is offering tunable light sources operating in the 450-650 nm wavelength range and include both the VIS and SWIR regions. The units, which include pre-aligned lamps, can be used for fluourescence and microscopy applications, as well as a component in spectroscopy. This product is now commercially available and is already being used in research medical applications. The division also now is offering what we believe are the best bacteriophage products in the world, thanks to our partnership with the Eliava Institute in the country of Georgia. The phages we are now offering include Pyo, Fersisi, SES, Staphylococcal, Intesti and Enkophagum. Dave Trudil, who directs the Biotech Division, has served as the critical link between Eliava and Brimrose Technology regarding the bacteriophage materials. “With the over-proliferation of antibiotics in our world, we are looking at bacteriophage materials as an important, natural alternative,” according to Trudil. To order or for more information call 410-472-2600. Brimrose Technology is a high-tech company involved in acousto-optic components for R&D applications as well as advanced materials solutions for the U.S. government and other institutions. It has generated more than $120 million in contracts throughout its history. Sparks, MD—NASA has selected Brimrose Technology Corp. (BTC) to provide sensor systems using Raman technology for future planetary exploration. The technology has other potential applications, as well. BTC is teaming with North Carolina State University as part of a Phase I Small Business Innovation Research award valued at $125,000. The proposed method and rugged instrument will be able to provide fast material identification regarding its molecular composition during planetary and asteroidal exploration missions. Brimrose Tech has a rich history of working with NASA on planetary exploration. Brimrose’s hyperspectral imager was highlighted in NASA’s recently issued annual NASA Spinoff 2016, The goal there was to use Brimrose’s highly intelligent acousto-optic tunable filter technology for Mars composition evaluation. The goal of this contract, entitled “Compact Raman Spectrometer for In-Situ Planetary Chemistry,” is to demonstrate a new Raman imaging sensor based on a compact, CCD-mounted spectrometer. This enables high sensitivity and specificity for UV-Raman that will be capable of full-frame imaging, thus reducing size, weight, and power requirements, as well as eliminating the need for mechanical scanning and actuators to acquire data across a two-dimensional image. The proposal team, which was led by BTC Senior Scientist Dr. Feng Jin, suggests the technology also has a significant number of potential non-NASA applications, including: chemical and explosive detection and identification; non-destructive detection/evaluation; pharmaceutical composition analysis; counterfeit detection; compound distribution; powder content and purity; polymorphic forms identification; and contaminant detection and identification; Medical applications include DNA/RNA analysis, drug/cell interactions study, and single cell analysis. Gemstone and mineral identification represents another potential application. Brimrose Technology is a high-tech company involved in advanced materials solutions for the U.S. government and other institutions. It has generated more than $120 million in contracts throughout its history and technology developed here has been used for commercial products by sister company Brimrose Corporation of America. Sparks, MD--Brimrose Technology Corp. (BTC) is excited to announce the unveiling of a new sector, our Biotechnology Division. This opens a new discipline of business for BTC, one which also brings us a strong presence into the life sciences. To prepare for our new division, BTC has been working with world-class biotech institutes and hiring qualified new staff. BTC is working with a variety of globally recognized institutes and companies, including the Eliava Institute in Tbilisi, Georgia; the Jiangsu Academy of Agricultural Sciences in Nanjing, China; NHDetect, Baltimore; and the International Phage Research Center. David Trudil has joined Brimrose to help coordinate efforts with NHDetect, a company he directs, and New Horizons Diagnostics Corp., a Maryland-based company which specializes in manufacturing tests for the rapid detection of bacteria and toxins in human, environmental, surface, food, and water samples for use by municipal and corporate customers. The company also works with local and national governmental agencies. Dr. Yingyun Liu, who has joined the Biotechnology Division to work on the application and detection of lytic enzymes. Like Trudil, Dr. Liu is also playing an important role in coordinating efforts with New Horizons Diagnostics Corporation. He received his Ph.D. from Penn State University, after prior study in China. One focus of research is on the utilization of the bacteriophage virus and Phage Lytic Enzymes for the treatment, prevention, control and detection of specific bacteria in the environment or in applications for agriculture, animal or food use. Bacteriophages, or bacteria eaters, occur in nature, kill bad bacteria, are safe for animals, are inexpensive, and do not harm the environment or cause the problems that antibiotics do. While bacteriophages have been used for some time with varying degrees of success, work by Trudil, the aforementioned Georgian and Chinese institutes, and other researchers working with Brimrose show significant progress and should lead to greater use of these important viruses. Working with the Eliava Institute, our new Biotechnology Division is offering a series of unique bacteriophage products which are being used to replace antibiotics in poultry feed and for other important applications. As mentioned, bacteriophages are “good” viruses that attack and kill bad bacteria that can harm poultry and other living things. The new division also is working with partners on the development of Fluorescence Strips for the rapid and sensitive detection of bacteria, viruses and toxins based on immunological (antibody-antigen) reactions. 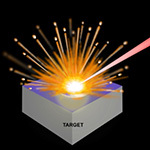 Sparks, MD--Brimrose Technology Corporation (BTC) has received a new Phase I SBIR (Small Business Innovation Research) grant from the United States Air Force regarding the use of new, advanced materials for enhanced radiation detection. The company is receiving $148,872 to develop new halide materials which may be critically important to the new, second generation of radiation detection devices that are gradually replacing older, first-generation, scintillator-based detectors. The new materials, developed under the leadership of Brimrose Technology’s Dr. Henry Chen, are considered rugged, portable, low cost and capable of detecting both gamma and neutron radiation. “Our goal is to deliver a breakthrough in detector technology that can address most, if not all, of the limiting issues of current technologies, and thus effectively provide an answer to the call for advanced detectors from the U.S. Department of Defense and the U.S. Department of Homeland Security,” said Chen. This new award comes less than two months after Brimrose Technology received four SBIR awards, two of which were Phase I and two that were Phase II. Chen spearheaded one of those Phase I awards, also, which was provided by NASA. While Brimrose Technology operates a very active and successful R&D program under the direction of Dr. Sudhir Trivedi, a program that has generated more than $100 million in R&D contracts during Brimrose’s 35-year history, the parent company generates 80 percent of its annual revenue from commercial products, which are based on the R&D work. The company also has been awarded a Phase II STTR from NASA Langley Research Center for $749,494 for “Acousto-Optic Tunable Filter-Based Polarimetric Spectral Sensor with Progressive Algorithm for Material Analysis and Mapping.” Dr. Trivedi is the principal investigator. The STTR addresses the NASA Planetary Science Mission to advance scientific knowledge of the origin and history of the solar system and the potential for life elsewhere. The work expands on the AOTF-based SWIR spectropolarimetric imaging system developed in Phase I which will be further optimized and integrated with optimal algorithm/software in Phase II. BTC believes this will be a useful tool in determining the chemical composition and physical characteristics of planets of interest, short period comets, primitive meteorites and asteroid bodies, and in identifying the sources of simple chemicals important to prebiotic evolution and the emergence of life. The award is for $749,494. NASA has awarded BTC a Phase I SBIR regarding “Novel Approach in Fabrication of Shielding Composite Materials by Emerging Field Assisted Sintering Technique.” The Principal Investigator is Dr. Trivedi. The objective is to develop a radiation shielding material system that is sufficiently strong to serve as a load-bearing structure. Such a materials system does not currently exist. The ideal shielding material for space applications should preferably be light weight with good mechanical strength and good thermal conductivity. BTC is proposing a novel approach to fabricate reinforced composite materials for radiation shielding applications using a powder metallurgy approach with sintering via the innovative Field Assisted Sintering Technology (FAST). The award is for $124,887. NASA has awarded Brimrose Tech a Phase I STTR related to “Instrumentation for Multiple Radiation Detection Based on Novel Halides for Nuclear Planetology.” BTC is proposing a spectrometer that employs a single room temperature semiconductor detector that can perform both gamma and neutron spectroscopy. 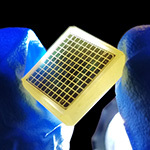 The proposed detector is based on novel halide materials. The halide materials are new wide band-gap semiconductor detector materials that can provide radiation detection with low cost, high performance and long term stability. BTC will be collaborating with Fisk University on this contract. The amount of the award is $124,859. Sparks, MD—Brimrose Technology Corporation (BTC) staff members have received an important patent (US 8,830,316 B2) related to improved data capturing for military and security purposes. The research team was led by Brimrose Senior Engineer Dr. Feng Jin. The patent, entitled Unattended Spatial Sensing, involves a low-cost, ground-based imaging sensor that can capture pixel data from a radiating target. The pixel data are sent to a remote location, where they are analyzed to fully identify the target. The patent was originally engineered to improve the capabilities of the company’s Unattended Ground Sensor (UGS) product, known as SPOT (Silhouette Profiling Optical Tripwire), which can identify targets in hostile environments using narrowband imaging. Using SPOT, the electromagnetic radiation from the target is intercepted and sent to a remote command location via a communications system, often including a satellite. The detector array included in the patent improves the information-capturing capability of SPOT so that the person receiving the signals will better be able to discern exactly what the target is. Sparks, MD—Brimrose Technology scientists are using the company’s extensive technology base in laser vibrometers for an important new application: the study of microcracking in gun and rifle barrels. Technologies are being developed at Brimrose that are capable of inspecting embedded defects in these and other metallic hollow cylinders. The scientists note that the inspection of hollow metallic cylinders present two challenges: (1) the curvy surfaces of barrels and (2) the generally rough surface quality they possess. Curvy surfaces present great challenges to ultrasonic inspection technologies since it is quite difficult to achieve or maintain sufficiently good physical contact between the flat transducer surface and the cylinders. Laser-based inspection technologies suffer from the simple fact that optical speckles induced by the metallic surface create an insurmountable obstacle in achieving a constantly reliable and accurate assessment of the conditions of the metallic cylinder under investigation. By using Brimrose’s proprietary pulsed laser vibrometer technology, the scientists can examine the hollow metallic cylinders by remotely sensing how the cylinder vibrates under given mechanical stimuli. They have discovered that the presence of a defect modifies the vibratory characteristics of the cylinder as slightly different modes are excited by the defect. Brimrose Technology scientists further have discovered that by determining the minute spectral shifts, characteristic dimensions of the defect can be estimated. Localized variations in the vibratory signatures can further be utilized to determine the location of the defect. With the knowledge concerning the dimensions and locations of the defect, further actions can be assessed and taken to rectify the operational challenges facing the reliable and safe deployment of gun barrels. Laser vibrometers are a core technology of Brimrose Technology’s and have been for more than two decades. Brimrose has used laser vibrometer technology successfully for a number of military programs, including vehicular weight monitoring, landmine detection, and trace molecule/explosives detection, among other things. Sparks, MD—Brimrose Technology Corporation, the R&D arm of Brimrose Corporation, believes it is important to maintain a military presence and mindset at the company. Brimrose regularly sends employees to the Storm Mountain Training Center facility in West Virginia to better experience and understand the conditions that exist for the soldiers it is designing equipment for. Storm Mountain also specializes in advanced urban sniper scenarios that potentially exist in real-world situations, including routing out suspected terrorists in buildings and at large events. Brimrose employees, who have attended classes extensively, stay abreast of the latest U.S. military measures and countermeasures, which in turn are engineered into Brimrose products for defense applications. It is only through this kind of experience that Dr. Rosemeier believes Brimrose employees can maintain the edge necessary to best provide the products required by American troops. Throughout its history, Brimrose Technology has developed tools for the warfighter, largely via its hyperspectral imaging technology, but also including its advanced materials program. Today, the company is developing HERO (Heli Engagement Reconnaissance Observatory), its unattended aerial vehicle for military sensing and firepower; optical taggants—used for the identification of troops and materials in theater; and military vests for women. For more information, call 410-472-2600. Baltimore—Brimrose Technology engineers are concentrating on extending the distances the military can use to identify optical taggants in the field and have developed proprietary designs to that effect. Brimrose hyperspectral imagers can currently identify such taggants up to distances of 50 feet at night and up to 150 feet during the day. The company wants to increase those target identification distances to 2,000 feet. Such distances would allow a helicopter pilot landing in a field to identify soldiers in the general area, for example, or make sure lethal force is used accurately in today’s increasingly complex, long-distance battlefield. Brimrose already has put extensive resources into optical taggant development. The company is capable of identifying optical taggants outside of the near IR range common to most international defense operations. This means soldiers will remain protected from non-friendly governments but are identifiable using the optical taggants Brimrose makes. Optical taggants can be used to tag, track and locate objects, targets or soldiers by modulating certain wavelengths in the short-wave IR (SWIR). Brimrose will be demonstrating its optical taggant identification capabilities at SPIE DSS this week. The company is located at Booth No. 957. For more information about Brimrose Technology or our optical taggants’ program, call 410-472-2600. BTC is the research laboratory of the Brimrose Corporation of America, a high-tech company involved in advanced materials development, acousto-optic components, near IR spectrometers, and high-tech solutions for the U.S. military. Leading Brimrose scientists and engineers are focused on providing ways to identify at a moment’s notice dangerous chemicals spread into the atmosphere in wartime and hazardous accident situations. President and CEO Dr. Ronald Rosemeier, himself a physicist, has taken a personal interest in the work and is heading the effort. “The world we live in unfortunately is becoming an increasingly dangerous place,” said Dr. Rosemeier. "By instantly identifying poisonous chemical agents in the atmosphere we can potentially save countless lives." Brimrose Technology Corporation has many years of experience in gas analysis using its proprietary acousto-optic tunable filter near infrared (AOTF-NIR) technology. The company is in the process of doing proof-of-principle testing using its AOTF multi-gas analyzer spectrometers. Using the full spectral range, the spectrometers can potentially match samples of any gas with models already developed and deliver the results to waiting officials in a few seconds. Gas can be pumped into the flow cell of the gas analyzer continuously. The absorption spectrum of the sampled gas is then measured in real time in the full spectral range of the spectrometer, which can potentially be matched with models already developed. The results can be obtained and transmitted to a waiting official in a matter of seconds. 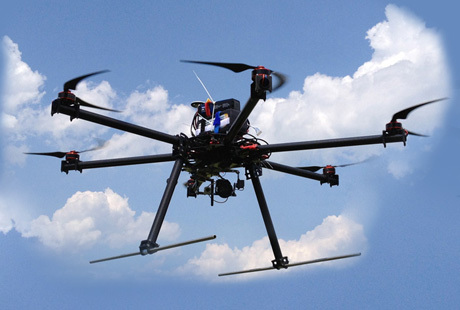 The proof of principle concept involves potentially mounting the AOTF-NIR spectrometer onto Brimrose’s autonomous unmanned flight vehicle, known as HERO (for Heli-Engagement Reconnaissance Observatory). HERO has the potential to fly in and through dangerous or hazardous areas and identify gases as it does so. "Our warfighters and first responders are too valuable to be rushing in uninformed to dangerous chemicals in the air,” said Dr. Rosemeier. “We are moving rapidly to find a realistic solution to this problem." Brimrose, a photonics and high-technology company, is launching an exciting new capability as the company has unveiled a series of reconfigurable, multipurpose unmanned aerial vehicles (UAVs) for potential tactical, surveillance and emergency applications. Brimrose is a world technology leader in the area of acousto-optic components, NIR instrumentation, and advanced materials for space applications serving the U.S. government and worldwide commercial industry since 1979. For additional information, call 410-472-7070.